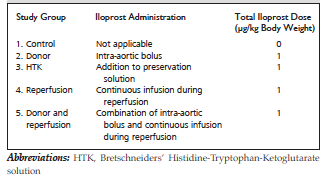 Objectives: Iloprost has the potential to protect the liver transplant graft before and during cold ischemia. We studied iloprost administration during organ procurement and reperfusion in an extra-corporeal pig liver perfusion model. Materials and Methods: German Landrace pigs (n = 7/group; 22-26 kg each) were used as donors. Preservation was performed by aortic perfusion with 2L Bretschneiders’ Histidine-Tryptophan-Ketoglutarate solution HTK and cold ischemia time (4°C) 20 hours followed by normothermic extracorporeal perfusion for 8 hours. Untreated controls (1) were compared to iloprost (2) donor bolus-treatment (1 μg/kg body weight), (3) addition of iloprost to Bretschneiders´ Histidine-Tryptophan-Ketoglutarate solution HTK (0.0125 μg/mL), (4) continuous infusion during reperfusion (2 ng/kg/min), and (5) combined treatment (2) and (4). Results: Iloprost donor treatment led to significantly higher bile production. Addition of iloprost to the preservation solution significantly improved hepatic artery perfusion and was accompanied by improve-ments of microcirculation and bile production. Iloprost reperfusion treatment alone significantly improved bile production. Enzyme levels were positively affected by all treatment regimens. Combined use of iloprost before and after ischemia improved hepatic artery flow and microcirculation and showed significantly lower hypoxia staining versus controls. Conclusions: Iloprost donor treatment and use of iloprost in the preservation solution significantly improved graft perfusion and function. The effects of graft treatment seemed greater before than after reperfusion. Combined treatment did not reveal a synergistic advantage. Liver perfusion (macro- and microcirculation). 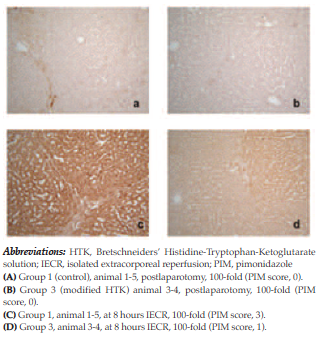 Hepatic injury assessed by enzyme release into reperfusion-fluid (serum level of alanine amino-transferase [ALT] and histology (hematoxilin/eosin and pimonidazole [PIM] ischemia staining). Hepatic function reflected by bile production. German Landrace pigs aged 10 to 16 weeks with a mean body weight (BW) 23.7 ± 1.56 kg (range, 22-26 kg) were used as organ donors. Animals were purchased (Fa. Sommerfeld, Brandenburg, Germany) and housed in our animal facility located at Charité Campus Virchow Klinikum, Berlin, Germany, approximately 1 week before each experiment. Animals were examined after delivery and kept species-appropriate with free access to water. Twice daily they were fed with standard pig nutrition pellets (Mpig-H, Sniff Spezialitäten GmbH, Soest, Germany) and housed at a day and night cycle of 12 hours and mean temperature 22°C. The animals fasted for 24 hours prior to donor operation with free access to water. Standardized principles of laboratory animal care were followed,8 and the studied complied with the current version of the German Law on the Protection of Animals. For anesthesia, each pig received a combined intramuscular injection with 5 mg/kg BW azaperone (Stresnil, Janssen-Cilag, Neuss, Germany), 10 mg/kg BW ketamine hydrochloride (Ursotamim, Serumwerk Bernburg AG, Germany) and 0.05 mg/kg BW atropine sulfate (Atropin, Fresenius Kabi Deutschland GmbH, Bad Homburg, Germany) as premedication. After the pig was recumbent, the ear vein was cannulated and 0.25 to 0.5 mg/kg BW etomidate (Etomidat-Lipuro, Braun, Melsungen, Germany) was administered intravenously as induction followed by 4 mg pancuronium bromide (Pavulon, Organon Teknika, Eppelheim, Germany). After endotracheal intubation, anesthesia was maintained by ventilation with oxygen and nitrous oxide (1:2) plus 1.5% to 1.8% isoflurane. A urinary catheter was placed and the external carotid artery was cannulated for blood gas analyses and blood pressure measurement. To mimic the clinical situation and potential clinical use, we administered iloprost (Ilomedin, Bayer-Shering AG, Berlin, Germany) during organ explant (1 μg/kg BW) and reperfusion (2 μg/kg BW). According to previous clinical experience, doses of 0.5 to 4 ng/kg BW/minute were used for continuous infusion after liver transplant4,9 and acute limb ischemia.10 Because the positive effects achieved with 1 ng/kg BW/min were mild,4 and we knew from clinical experience that a dosage of 4 ng/kg BW/minute usually was difficult to achieve because of adverse events,9 we used 2 ng/kg BW/minute. When planning the study, we knew that the pigs would have a mean BW 25 kg. After treatment for 8 hours (2 ng/kg BW/min), this would result in a total dose of 24 μg, which corresponded to a dose of 1 μg/kg BW. To test different methods of iloprost administration (preischemia, during reperfusion, and combined use), 5 study groups were arranged (Table 1). After median laparotomy, ligature of the cystic duct, and cannulation of the common hepatic duct, the pigs were heparinized with 10 000 IU and a perfusion system was inserted into the infrarenal aorta. Animals in group 2 received an intra-aortic bolus injection of iloprost (1 μg/ kg BW). At 1 minute after bolus injection, the supraceliac aorta was ligated and perfusion was started with 2 L cold (4°C) Bretschneiders’ Histidine-Tryptophan-Ketoglutarate (HTK) solution (Custodiol, Dr. Koehler Chemie, Alsbach-Haehnlein, Germany). Additional topical cooling was performed with 4°C cold saline. After liver explant, back table cannulation of the hepatic artery and portal vein was performed. The liver was stored at 4°C for CIT 20 hours. B. Braun, Melsungen, Germany). The reperfusion solution consisted of previously collected 2 L fully heparinized allogeneic porcine whole blood, 40 mg tobramycin, 1.5 L plasma-isotonic electrolyte solution, and 500 mL hydroxyethyl starch 6% (Voluven 6%, Fresenius Kabi Deutschland GmbH, Bad Homburg, Germany). Extracorporeal reperfusion was performed for 8 hours. In the arterial system, a mean pressure 71 mm Hg was achieved, and pressure varied from 58 to 91 mm Hg. Pressure was controlled using a hydrostatic pressure transducer (Peter von Berg Extrakorporale Systeme-Medizintechnik GmbH, Kirechssnon/-Eglharting, Germany) attached to a monitor (HP 78534C, Hewlett and Packard GmbH, München, Germany). Roller pump 1 (defined as the whole system flow [WS] pump) pumped the perfusion fluid from the liver chamber, in which the liver floated freely in the perfusion medium fixed to connectors of lines to the hepatic artery and portal vein, to the perfusion medium reservoir. The perfusion medium level was held constant at 20 cm above the liver, regulated by adjustments of WS. The resulting perfusion pressure in the portal vein varied from 12 to 23 cm water column; mean pressure was 17.9 cm water column. Roller pump 2 pumped the perfusion medium through an oxygenator (Safe Mini, Jostra Polystan AG, Hirrlingen, Germany) to the hepatic artery. Oxygenation was realized by carbogen (95% oxygen and 5% carbon dioxide) insufflation to the oxygenator. This resulted in an arterial partial pressure of oxygen 350 to 550 mm Hg. Hepatic artery and portal vein flow were measured in mL/min with a flow meter.11,12 Bile production was monitored by collection in a calibrated 50-mL plastic vial attached to the liver chamber, and special attention was made not to bend the collecting tube (Figure 1). The WS flow (mL/g LW/min) and hepatic artery and portal vein flow (displayed as % WS). regional blood flow velocity (V) at a tissue depth 4 mm. Release of enzymes into the reperfusion medium (alanine aminotransferase [ALAT]). Samples were measured directly with an autoanalyzer at the central laboratory of the Department for Laboratory Medicine and Pathobiochemistry, Charité CVK, Berlin, Germany. Oxygen consumption = avDO2 × Q, where Q = WS flow (mL/g LW/min), avDO2 = arterial - venous oxygen concen-tration, oxygen concentration = 1.34 × [Hb] × SO2 × 0.0001, and Hüfner number for blood = 1.34. The microcirculatory parameters (SO2, rHb, F, V) were assessed at tissue depth 4 mm using a commercially available combined laser Doppler flow meter and remission spectroscopy device (Oxygen-To-See [O2C], LEA Medizintechnik, Giessen, Germany). The technique and reliability testing were described previously.13-17 Microvascular blood flow (recorded in arbitrary units [AU]) was derived from the power spectra of back scattered laser light representing the distribution of Doppler shifts of the erythrocyte velocities. The rHb and SO2 values were derived from light spectra detected after tissue illumination and back scattering. Information was gathered primarily from small arteries, capillaries, and venules as light that entered vessels > 100 μm was completely absorbed.18 Most (85%) hemoglobin was in the capillary venous compartment of the microcirculation, and measurements with this spectrometer primarily reflected the capillary venous oxygen saturation and capillary venous rHb. The fiber probe was gently placed on the liver surface for 60 seconds and values were recorded every 2 seconds. Off-line analysis was performed sub-sequently. Regional SO2 (capillary venous oxygen saturation [%]): Primarily capillary venous oxygen saturation was measured, which was the amount of oxygen bound to hemoglobin after distribution of oxygen into the tissue. This was the area in the tissue where critical oxygen supply appeared first (defined as lethal corner). In contrast with arterial oxygen saturation, the capillary venous oxygen saturation showed the balance between oxygen delivery and consumption. Therefore, the local oxygen measure-ment was a parameter to determine the condition of local tissue hypoxia. Regional hemoglobin (rHb [AU]): The hemoglobin values were relative values and reflected the filling of vessels or vessel density per catchment volume. It showed microvessel filling that was dependent on capillary density, capillary recruitment, and venous filling. Regional flow (F [AU]): regional blood flow showed volume flow in relative units. The blood flow indicated ischemia or hyperemia. Regional velocity (V [AU]): Regional blood flow velocity (arbitrary units). 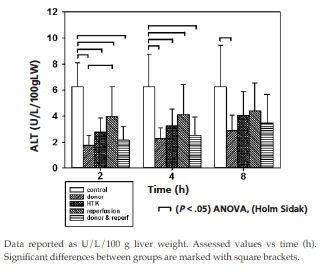 At 5 different times, wedges of 1 mL liver tissue were collected and immediately fixed in 10% formalin: (A) directly after donor laparotomy (prior to preservation); (B) after 20 hours CIT (which was identical to 0 hours isolated extracorporeal reperfusion [IECR]); (C) after 0.5 hours IECR; (D) after 2 hours IECR, and (E) 8 hours IECR. Samples were processed and embedded in paraffin. The sections (4-μm thick) were stained with hematoxylin-eosin. The slides were analyzed blinded by a pathologist (TS). Histologic severity of injury was graded according to a semiquantitative score (0, no injury; 3, severe injury) for 6 parameters (hepatocyte cell necrosis, activation of Kupffer cells, sinusoidal dilation, congestion, diffuse hepatic injury, and endothelial damage) and the scores were summed to provide a total score (total maximum score, 18). At 1.5 hours after reperfusion, PIM (80 mg/kg LW) (Hypoxyprobe-1, Burlington, MA, USA) was added to the perfusion circuit. The method of immuno-histochemical analysis for PIM was described previously.19-21 Liver sections were deparaffinized with xylene and rehydrated using decreasing dilutions of ethanol and distilled water. A peroxidase blocking step was performed using 3% hydrogen peroxide for 15 min, followed by antigen retrieval. A monoclonal antibody for fluorescein isothiocyanate (FITC-Mab 1, Hypoxyprobe, Burlington, MA, USA) was used as the primary antibody (1:400) for 30 minutes. Horseradish peroxidase was used as the secondary antibody linked to rabbit anti-FITC immunoglobulin G at a dilution of 1:100 for 30 minutes. The slides were analyzed blinded by the pathologist (TS) according to a semiquantitative score (PIM staining: 0, none; 1, mild; 2, moderate; 3, severe). Data were expressed as mean ± standard deviation (SD) for parametric data and median with range for ordinal data. 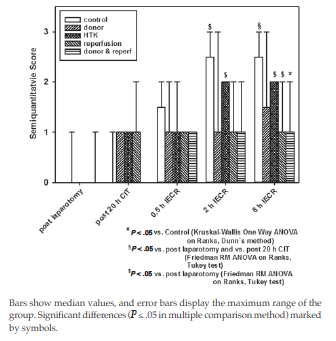 Analysis of variance (ANOVA) for repeated measures and ANOVA on ranks for the ordinal data or parametric data that failed normality test were used to analyze differences between groups. Values of P ≤ .05 were considered statistically significant. Prospective power analysis (for ANOVA and P ≤ .05) with an expected 10% difference of means between groups and an expected SD 5% for a desired power ≥ 0.8 showed a study population of 7 pigs per group. Data processing and display were done using statistical software (Sigma Plot 2004 for Windows, Version 9.01, Systat Software, Inc., Chicago, IL, USA). For a clearer presentation, the hourly measurements were described only at distinct times, 2, 4, and 8 hours (for macro- and microcirculation, enzyme levels, and bile production) after beginning reperfusion. Significant differences between groups were marked in Figures 3 to 11. The WS flow was constant in all groups during the period of measurement. Significant differences were observed between groups: at 2 hours, group 4 (3.27 ± 0.98 mL/g LW/min) had significantly higher WS flow than group 3 (2.08 ± 0.51 mL/g LW/min) or group 5 (1.96 ± 0.30 mL/g LW/min). Group 4 at 4 hours (3.28 ± 0.96 mL/g LW/min) and 8 hours (2.89 ± 1.02 mL/g LW/min) showed significantly higher values than all other treatment groups (group 2: 4 h, 2.10 ± 0.73 mL/g LW/min; 8 hours, 2.12 ± 0.72 mL/g LW/min) (group 3: 4 hours, 2.05 ± 0.46 mL/g LW/min; 8 hours, 1.63 ± 0.27 mL/g LW/min) (group 5: 4 hours, 2.06 ± 0.34 mL/g LW/min; 8 hours, 1.85 ± 0.36 mL/g LW/min) (control group: 4 hours, 2.33 ± 1.00 mL/g LW/min; 8 hours, 1.96 ± 0.52 mL/g LW/min) (Figure 3). After 2 hours, significantly higher hepatic artery flow was observed in group 3 (24.0% ± 5.9% WS flow) than the control group (15.1% ± 2.6 %WS flow) or group 4 (13.3% ± 5.0% WS flow). 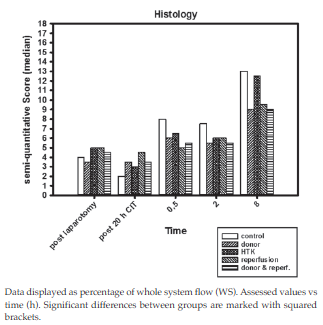 Group 5 (19.61% ± 4.72% WS flow) also showed significantly higher hepatic artery flow than the control group. After 4 hours IECR, results were similar. Modification of HTK caused significantly increased hepatic artery flow (24.9% ± 5.2% WS flow) compared with the control group (17.4% ± 5.6% WS flow) or reperfusion treatment (14.6% ± 6.2% WS flow). 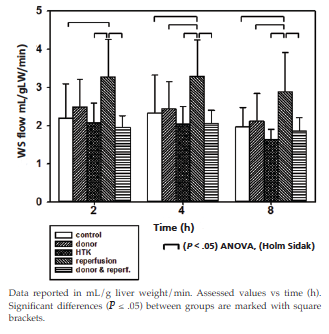 After 8 hours, group 3 (23.7% ± 7.0% WS flow) had significantly higher hepatic artery flow than control (12.6% ± 4.6% WS flow), group 2 (14.7% ± 5.5% WS flow), or group 4 (10.0% ± 3.8% WS flow), and group 5 (18.94% ± 4.23% WS flow) had significantly higher hepatic artery flow than group 1 or group 4 (Figure 4). 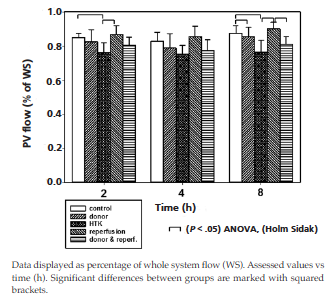 In contrast, portal vein flow after 2 hours was significantly higher in the control (84.9% ± 2.6% WS flow) and reperfusion treatment groups (86.7% ± 5.0% WS flow) than group 3 (76.0% ± 5.9% WS flow) (Figure 5). After 4 hours, portal vein flow was significantly higher in group 4 (85.4% ± 6.2% WS flow) than group 3 (75.1% ± 5.2% WS flow). 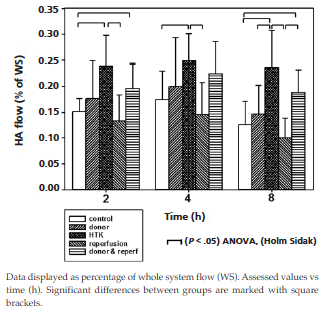 At the end of IECR (8 h), portal vein flow was significantly greater in group 4 (90.0% ± 3.8% WS flow) than group 5 (81.06% ± 4.23% WS flow) or group 3 (76.3% ± 7.0% WS flow), and greater in group 1 (87.4 ± 4.6) than group 2 (85.3% ± 5.5% WS flow) or group 3 (76.3% ± 7.0% WS flow). Off-line analysis of microcirculatory values revealed artifacts that necessitated exclusion before statistical analysis. For analysis, blocks of 10 corresponding artifact-free values were used. At 2 hours after reperfusion, no significant differences between groups were found in capillary venous SO2. Capillary venous SO2 was significantly higher in the reperfusion treatment group than all other groups after 4 hours IECR. At 8 hours reperfusion, livers pretreated with modified HTK solution had significantly higher SO2 than all other groups. 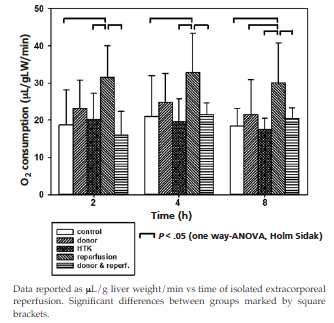 Livers treated with continuous iloprost administration during reperfusion had significantly higher SO2 values than livers of the control group or livers treated with combination before explant and during reperfusion (group 5) (Figure 6). At 2 hours, rHb was significantly higher in the combination treatment group (group 5) than all other groups. At 4 hours after reperfusion, the control group had significantly higher rHb than group 2 or the combination treatment group (group 5), but group 5 had significantly higher values than group 2 or group 3. Continuous treatment during reperfusion (group 4) caused significantly higher values than in group 2. At the end of IECR (8 h), rHb was significantly higher in group 5 than all other groups (Figure 6). At 2 hours after start of IECR, microcirculatory blood flow was significantly higher in treatment group 2 than all other groups. At 4 hours, group 5 had the highest blood flow values, significantly higher than the control group (group 1) or donor pretreatment group (group 2). 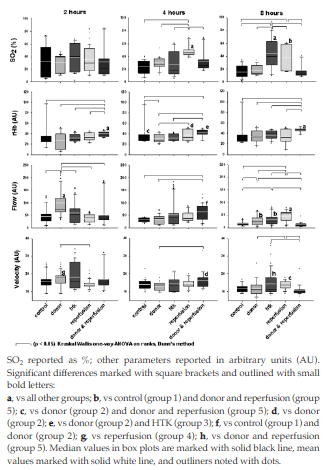 At the end of IECR, varied significant differences were observed; group 4 had higher F than all other groups; group 3 had higher F than the control group or group 5; and the donor pretreatment group (group 2) had higher F than the control or combination treatment group (Figure 6). At 2 hours IECR, V was significantly higher in livers in group 2 (donor) than livers treated continuously during reperfusion (group 4). After 4 hours, group 5 (combination treatment) had significantly higher V than group 2. At the end of IECR, group 3 (modified HTK) had significantly higher V than group 2 or group 5, and group 4 had significantly higher V than group 5 (Figure 6). At 2 hours, oxygen consumption was significantly greater with reperfusion treatment (31.5 ± 8.5 μL/g LW/min) than control (18.8 ± 9.4 μL/g LW/min), HTK (20.2 ± 7.1 μL/g LW/min), or combined treatment (16.0 ± 6.3 μL/g LW/min). At 4 hours IECR, similar significant differences were observed; oxygen con-sumption was greater with reperfusion treatment (32.9 ± 10.6 μL/g LW/min) than control (21.0 ± 11.0 μL/g LW/min), HTK (19.7 ± 6.1 μL/g LW/min), or combined treatment (21.5 ± 3.1 μL/g LW/min). At 8 hours, reperfusion treatment showed significantly higher oxygen consumption (30.1 ± 10.7 μL/g LW/min) than all other groups: control (18.5 ± 4.7 μL/g LW/min), donor bolus treatment (21.6 ± 9.3 μL/g LW/min), HTK (17.5 ± 3.0 μL/g LW/min), or combined treatment (20.4 ± 3.0 μL/g LW/min) (Figure 7). At 2 hours, grafts of group 2 (0.17 ± 0.03 μL/g LW/min) and group 4 (0.18 ± 0.06 μL/g LW/min) produced significantly more bile than the control group (0.09 ± 0.05 μL/g LW/min). No significant difference was observed between the treatment groups. After 4 hours, significantly more bile production was observed in group 4 (0.20 ± 0.06 μL/g LW/min) than the control group (0.08 ± 0.07 μL/g LW/min) or group 5 (0.12 ± 0.08 μL/g LW/min). In addition, group 3 (0.17 ± 0.09 μL/g LW/min) had significantly more bile production than the control group. At 8 hours IECR, significantly more bile production was observed with livers of group 3 (0.07 ± 0.03 μL/g LW/min) or 4 (0.09 ± 0.03 μL/g LW/min) than the control group (0.04 ± 0.02 μL/g LW/min) (Figure 8). Levels of ALAT were lower at all times in treated grafts than the control group. At 2 hours, the control group (6.26 ± 1.82 U/L/100 g LW) had significantly higher values than all treatment groups: group 2 (1.74 ± 0.78 U/L/100 g LW), group 3 (2.77 ± 1.08 U/L/100 g LW), group 4 (3.69 ± 2.30 U/L/100 g LW), or group 5 (2.15 ± 1.09 U/L/100 g LW). At 2 hours, donor pretreatment showed significantly lower levels than reperfusion treatment. At 4 hours, after starting reperfusion, there were no significant differences between the treatment groups, but ALAT levels were significantly greater in the control (4.58 ± 2.51 U/L/100 g LW) than all treatment groups: group 2 (2.27 ± 0.82 U/L/100 g LW), group 3 (3.25 ± 1.30 U/L/100 g LW), group 4 (4.12 ± 2.32 U/L/100 g LW), or group 5 (2.51 ± 1.14 U/L/100 g LW). At 8 hours, a significant difference was observed only between the control group (6.26 ± 3.20 U/L/100 g LW) and group 2 (2.89 ± 1.19 U/L/100 g LW) (Figure 9). Evaluation with hematoxylin-eosin stain showed that liver injury increased with increased time of IECR. There were no statistically significant differences between groups. At 0.5 hours IECR, all treatment groups had less damage. The same was observed after 2 hours IECR. At the end of IECR, this pattern persisted, except for group 3 that had values almost as high as the control group (Figure 10). With PIM staining (median [range]), combined treatment (1 [0-2]) showed significantly less PIM staining than control (2.5 [2-3]) at 8 hours IECR. Donor treatment and combined treatment did not show significant differences in PIM staining with time; however, all other groups showed significant differences with time: control at 2 hours IECR (2.5 [1-3]) and 8 h IECR (2.5 [2-3]) vs postlaparotomy (0 [0-0]) and after 20 hours CIT (0 [0-1]); HTK at 2 hours (2 [1-2]) and 8 hours (2 [0-2]) versus post-laparotomy (0 [0-0]); and reperfusion treatment at 8 hours (1 [1-2]) versus postlaparotomy (0 [0-0]). Mild PIM staining was recognized sporadically in biopsies taken before PIM application to the reperfusion circuit (Figure 11). Examples of histologic slides with PIM staining were shown in Figure 12. In the past, different experimental and clinical approaches were applied to protect or recover liver grafts from ischemia-reperfusion injury. A variety of clinical studies showed benefits of prostaglandin treatment with respect to enzyme release and occurrence of initial poor function and nonfunction. The use of prostaglandins is accepted widely after clinical and experimental liver transplant.1-3 However, prostaglandin use as liver donor treatment, although beneficial clinically5 and experimentally,6,7 is uncommon, and the recommended dosage and type of application are unknown. The present study provided an overview of 4 different kinds of iloprost treatment and their effects on hepatic injury and function following extended cold ischemia. According to Gores and coworkers, the viability of extracorporeally perfused rat livers ranges, under optimal conditions, up to 6 hours.22 In contrast, Yamamoto and associates reported a 72 hour successful pig liver perfusion under hypothermic conditions.23 Since bile production as a marker of graft function in our model was reduced after 4 hours in all groups, the interpretation of all results obtained from measurements beyond this threshold must be performed with caution. Although there is evidence provided by this and many other studies that prostaglandins act at a microvascular level, the beneficial action of prostag-landins also may be, in part, due to a macrovascular effect. The intense vasospasm caused by cold perfusion may diminish homogeneity of organ perfusion with preservation solution. As a result of modification of preservation solution, we were able to show a significantly higher percentage of hepatic artery flow than control and reperfusion treatment. Combined donor bolus and reperfusion treatment showed this effect for the entire 8 hours IECR. Bile production is a suitable index to assess the extent of ischemic liver injury and enables the estimation of general graft function.24,25 Conditioning of liver grafts by bolus treatment with prostaglandins previously has been demonstrated to improve hepatic bile production.6 Additionally, it was shown that the higher amount of bile production is not due to increased paracellular permeability, but is based on markedly improved bile acid output.26 We detected more bile production in grafts of pretreated donors and donors that had administration during reperfusion. This effect was not observed when both treatments were combined. Although bile production was significantly increased after donor treatment (2 hours), the effect of donor treatment decreased after 2 hours. The HTK treatment showed beneficial effects on bile production at 4 and 8 hours of reperfusion. Reperfusion treatment showed sig-nificantly higher bile production during the whole reperfusion period. Bile production was triggered mostly by portal venous flow. Combination treatment (donor and reperfusion) had no additional effect on bile production but minimized it. Taking the macroscopic hemodynamic measurements into account, it seemed that application of iloprost during reperfusion could not develop full potency after donor treatment was performed. The effects of higher hepatic artery flow dominated (via hepatic autoregulatory mechanisms27) the reperfusion treatment effects on portal vein flow. Our observations of oxygen consumption underscored this finding. Oxygen consumption was significantly higher in reperfusion treatment than control, HTK, or combination treatment after 2 and 4 hours or donor treatment after 8 hours IECR. After 4 hours, bile production in all groups was markedly reduced. Nevertheless, HTK modification and reperfusion treatment showed significantly higher bile production than control. The significantly lower release of transaminases after preconditioning liver grafts with prostaglandins has been described earlier in clinical5 and expe-rimental studies.5,7 Furthermore, prostaglandin treatment administered after transplant showed lower levels of aspartate aminotransferase and ALAT in a clinical setting.28 With our IECR model, we could reproduce this finding, and all tested iloprost treatment regimens significantly reduced ischemia-reperfusion injury. Moreover, donor treatment was significantly more protective concerning ALAT release than reperfusion treatment at 2 hours. After 8 hours, donor treatment was the only regimen that still showed significantly lower injury than the control group. To understand the benefits of prostaglandin treatment, several experimental approaches have been used, especially to understand its role in preventing microcirculatory disturbances.6 In the present study, we tested a method of microcirculation assessment that combined laser Doppler flow and remission spectroscopy. Off-line analysis of recorded micro-circulation values revealed large variation and many artifacts, indicating that this technique was not easy to use in the present arrangement, but required training and patience. Nevertheless, this technique reflected the effect of iloprost on microcirculation by showing significant differences between treatment groups and the control group and between the different treatment groups. This method has not been used in pig IECR thus far, but measurements in mouse livers13 and pig15 and human29 intestinal mucosa during sepsis episodes have been per-formed, providing evidence that microcirculatory disturbances can be measured. Ischemia-reperfusion, reflected by compromised nutritional perfusion and leukocyte adherence, can be decreased significantly by prostacyclin donor bolus pretreatment, as shown previously in a rat liver transplant model using intravital microscopy for microcirculatory measure-ments.6 The findings of the present study were consistent with this finding and provided further information, because our data showed that microcirculatory perfusion of iloprost treatment groups was significantly improved compared with controls. Reperfusion treatment and addition of iloprost to HTK (group 3) revealed the highest capillary venous oxygen saturation. Regional flow at 2 hours as a marker to distinguish between ischemia and hyperemia revealed a clear benefit of donor treatment compared with all other groups. Prostaglandins have been shown previously in a rat liver IECR model to protect endothelial cells from damage when administered during reperfusion.30 We also observed a protective effect, although histologic analysis of slides stained with hematoxylin-eosin did not reveal statistically significant differences between the treatment groups. However, PIM staining revealed interesting results. The PIM staining is a well established hypoxia marker in studies with animal livers.31-34 After intravenous injection, PIM, a 2-nitroimidazole, binds to thiol groups of proteins in tissues with oxygen tensions < 10 mm Hg,20 where it can be detected with commercially available anti-PIM antibodies. 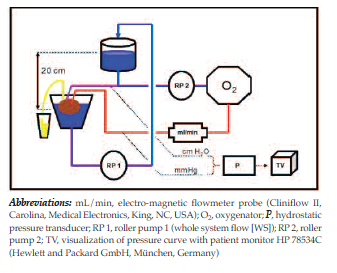 To our knowledge, this method was not used previously in extracorporeal pig liver perfusion. Combined treatment showed significantly less PIM staining compared with control at 8 hours IECR. Donor bolus treatment and combined treatment did not show significant differences in PIM staining with time, but all other groups had differences. Thus, it appears that both kinds of application provided the best protection against tissue hypoxia among all groups. In conclusion, iloprost donor treatment and the use of iloprost in the preservation solution may significantly improve graft perfusion, injury, and function. Intra-aortic donor treatment seems to be the best type of treatment, followed by modified HTK. The effects of graft treatment were greater before than after ischemia, which is the most common clinical use of prostaglandins. Combined use of iloprost before and after ischemia showed no synergistic advantages. Future research may evaluate whether a combination of donor treatment and addition to the preservation solution or donor treatment combined with a later onset of reperfusion treatment may improve the protective effect. Klein AS, Cofer JB, Pruett TL, et al. Prostaglandin E1 administration following orthotopic liver transplantation: a randomized prospective multicenter trial. Gastroenterology. 1996;111(3):710-715. Neumann UP, Kaisers U, Langrehr JM, et al. Treatment with PGE1 in patients after liver transplantation. Transplant Proc. 1998;30(5):1869-1870. Neumann UP, Kaisers U, Langrehr JM, et al. Reduction of reperfusion injury with prostacyclin I2 after liver transplantation. Transplant Proc. 1999;31(1-2):1029-1030. Bärthel E, Rauchfuss F, Hoyer H, et al. Impact of stable PGI2 analog iloprost on early graft viability after liver transplantation: a pilot study. Clin Transplant. 2012;26(1):E38-E47. Klein M, Geoghegan J, Wangemann R, Böckler D, Schmidt K, Scheele J. Preconditioning of donor livers with prostaglandin I2 before retrieval decreases hepatocellular ischemia-reperfusion injury. Transplantation. 1999;67(8):1128-1132. Anthuber M, Farkas S, Rihl M, et al. Conditioning of liver grafts by donor bolus pretreatment with epoprostenol. Transplantation. 1996;62(1):13-17. Morioka D, Kubota T, Sekido H, et al. Prostaglandin E1 improved the function of transplanted fatty liver in a rat reduced-size-liver transplantation model under conditions of permissible cold preservation. Liver Transpl. 2003;9(1):79-86. National Institutes of Health. Revised guide for the care and use of laboratory animals. NIH Guide. 1996;25(28). Neumann UP, Kaisers U, Langrehr JM, et al. Administration of prostacyclin after liver transplantation: a placebo controlled randomized trial. Clin Transplant. 2000;14(1):70-74.
de Donato G, Gussoni G, de Donato G, et al. The ILAILL study: iloprost as adjuvant to surgery for acute ischemia of lower limbs: a randomized, placebo-controlled, double-blind study by the Italian Society for Vascular and Endovascular Surgery. Ann Surg. 2006;244(2):185-193. Heise M, Krüger U, Settmacher U, Sklenar S, Neuhaus P, Scholz H. A new method of intraoperative hydraulic impedance measurement provides valuable prognostic information about infrainguinal graft patency. J Vasc Surg. 1999;30(2):301-308. Heise M, Krüger U, Rückert R, et al. Correlation between angiographic runoff and intraoperative hydraulic impedance with regard to graft patency. Ann Vasc Surg. 2003;17(5):509-515. Albuszies G, Radermacher P, Vogt J, et al. Effect of increased cardiac output on hepatic and intestinal microcirculatory blood flow, oxygenation, and metabolism in hyperdynamic murine septic shock. Crit Care Med. 2005;33(10):2332-2338. Knobloch K, Lichtenberg A, Pichlmaier M, Tomaszek S, Krug A, Haverich A. Palmar microcirculation after harvesting of the radial artery in coronary revascularization. Ann Thorac Surg. 2005;79(3):1026-1030. Pittner A, Nalos M, Asfar P, et al. Mechanisms of inducible nitric oxide synthase (iNOS) inhibition-related improvement of gut mucosal acidosis during hyperdynamic porcine endotoxemia. Intensive Care Med. 2003;29(2):312-316. Knobloch K, Tomaszek S, Lichtenberg A, Karck M, Haverich A. Long-term palmar microcirculation after radial artery harvesting: An observational study. Ann Thorac Surg. 2006;81(5):1700-1707. Knobloch K, Tomaszek S, Spies M, Lichtenberg A, Busch KH, Vogt PM. No change of palmar microcirculation at rest 2 years after radial artery harvesting. J Plast Reconstr Aesthet Surg. 2009;62(7):920-926. Gandjbakhche AH, Bonner RF, Arai AE, Balaban RS. Visible-light photon migration through myocardium in vivo. Am J Physiol. 1999;277(2 pt 2):H698-H704. Rosenberger C, Griethe W, Gruber G, et al. Cellular responses to hypoxia after renal segmental infarction. Kidney Int. 2003;64(3):874-886. Franko AJ, Chapman JD. Binding of 14C-misonidazole to hypoxic cells in V79 spheroids. Br J Cancer. 1982;45(5):694-699. Kennedy AS, Raleigh JA, Perez GM, et al. Proliferation and hypoxia in human squamous cell carcinoma of the cervix: first report of combined immunohistochemical assays. Int J Radiat Oncol Biol Phys. 1997;37(4):897-905. Gores GJ, Kost LJ, LaRusso NF. The isolated perfused rat liver: conceptual and practical considerations. Hepatology. 1986;6(3):511-517. Yamamoto N, Konishi Y, Wakashiro S, et al. 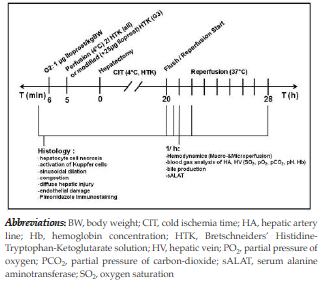 Seventy-two-hour preservation of porcine liver by continuous hypothermic perfusion with UW solution in comparison with simple cold storage. J Surg Res. 1991;51(4):288-292. 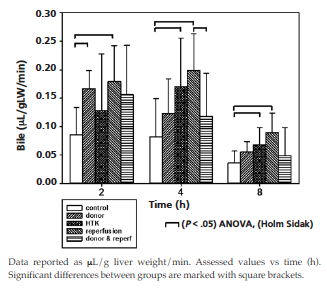 Sumimoto K, Inagaki K, Yamada K, Kawasaki T, Dohi K. Reliable indices for the determination of viability of grafted liver immediately after orthotopic transplantation. Bile flow rate and cellular adenosine triphosphate level. Transplantation. 1988;46(4):506-509. Bowers BA, Branum GD, Rotolo FS, Watters CR, Meyers WC. Bile flow - an index of ischemic injury. J Surg Res. 1987;42(5):565-569. Farkas S, Bolder U, Schlittenbauer T, et al. Conditioning of liver grafts with prostaglandins improves bile acid transport. Transplant Proc. 2005;37(1):435-438. Lautt WW, Legare DJ, Ezzat WR. Quantitation of the hepatic arterial buffer response to graded changes in portal blood flow. Gastroenterology. 1990;98(4):1024-1028. Kornberg A, Schotte U, Kupper B, Hommann M, Scheele J. Impact of selective prostaglandin E1 treatment on graft perfusion and function after liver transplantation. Hepatogastroenterology. 2004;51(56):526-531. Temmesfeld-Wollbrück B, Szalay A, Mayer K, Olschewski H, Seeger W, Grimminger F. Abnormalities of gastric mucosal oxygenation in septic shock: partial responsiveness to dopexamine. Am J Respir Crit Care Med. 1998;157(5 pt 1):1586-1592. Itasaka H, Suehiro T, Wakiyama S, Yanaga K, Shimada M, Sugimachi K. The mechanism of hepatic graft protection against reperfusion injury by prostaglandin E1. Surg Today. 1999;29(6):526-532. Xia CY, Li L, Liu HM, Cong WM. High expression of angiotensin-converting enzyme and angiotensin-converting enzyme 2 in preservation injury after liver transplantation in rats. Hepatol Res. 2009;39(11):1118-1124. Chaudhuri S, McCullough SS, Hennings L, et al. Acetaminophen hepatotoxicity and HIF-1α induction in acetaminophen toxicity in mice occurs without hypoxia. Toxicol Appl Pharmacol. 2011;252(3):211-220. Cheluvappa R, Hilmer SN, Kwun SY, et al. The effect of old age on liver oxygenation and the hepatic expression of VEGF and VEGFR2. Exp Gerontol. 2007;42(10):1012-1019. Cheluvappa R, Hilmer SN, Kwun SY, Cogger VC, Le Couteur DG. Effects of old age on hepatocyte oxygenation. Ann N Y Acad Sci. 2007;1114:88-92.